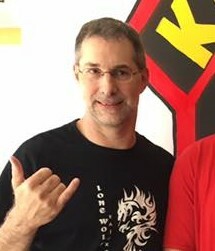 Sifu Tony “Lone Wolf” Miele, our Chief Instructor, holds a third degree black belt in Emperado Method Kajukenbo, and has practiced Martial Arts for over 35 years. He has also studied Kwan Ming Wah/Iron Dragon Chinese Kenpo, Shotokan Karate, Tang Soo Do, Hung Fut Kung Fu, Taekwondo, Hopkido, and Aikido. Mr. Miele was given the fighting name Lone Wolf by his teacher Professor Robert “Tornado” Dutilly, who holds an eighth degree in Kajukenbo. Professor Dutilly teaches classes in Western Massachusetts, and frequently visits the Lone Wolf Kajukenbo studio. Professor Dutilly has competed extensively in kick boxing, karate, and judo tournaments over the years, claiming many first place and grand championship titles. Sifu Miele started his training in the martial arts in 1983 at Western New England University in Springfield, MA. During those initial years, Sifu Miele was fortunate to train on campus with Professor Dutilly, with Grand Master Kalaii Griffin at his dojo, and with several early generation “Iron Dragon” black belts who trained with GM Griffin. Sifu Miele spent a number of years in the Washington, DC area, where he studied a number of styles including Ki Aikido, Tang Soo Do, Shotokan Karate, and Shaolin Hung Fut Kung Fu. Mr. Miele is also a father of four wonderful children, a soccer coach, an electrical engineer, and an intellectual property attorney.